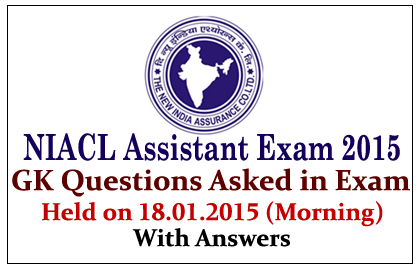 List of General Awareness Questions asked in New India Assurance Co. Ltd Assistant examination held on 18thJanuary 2015 Morning batch. Candidates those who are preparing for this examination can use these questions for practice. Why the RBI does increase its interest rates? On whose memory does 3rd Sunday of January was celebrated? Vanbandhu Kalyan Yojna scheme was launched for? Which of the following has owned the DICGC? Which of the following regulated the Commodity Market? What is the minimum capital for White Label ATMs? What is the headquarter of ILO? What is the female population as per census? In which field does Patrick Modiano have novel? Who is the winner of the Abu Dabhi Tennis Championship? Where the next NATO Summit was yet to be held? How much diseases do the Mission Indradhanush covers? Ankita Raina Belongs to which of the following sports? Who is the Union Minister for Heavy Industries? Which two places does the Gandhi Setu Connects?